Two construction skills students in receipt of a Duchy of Lancaster bursary are heading for distinctions in their Finals next year. 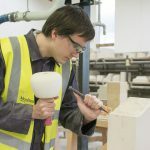 Peter Maynard and Tom Roscoe are both studying stonemasonry at Moulton College in Northamptonshire and have spent the last year applying their knowledge to practical training roles within the workplace. These placements have included major restoration projects at Exeter Cathedral and the Roman site at Chester Farm in Wellingborough. 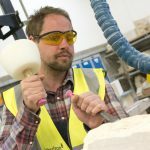 Peter also represented the College at the National Skillbuild challenge in London where more than 80 students, trainees and apprenticeships demonstrated their skills in a wide range of disciplines including cabinet-making, dry stonewalling, carpentry, roofing, tiling and stonemasonry. Both have received distinctions in their studies throughout the year and are now preparing submissions for the Wellingborough Zoo project, with Peter producing a carving and Tom a sculpture for public display next year. In addition to the construction skills bursary launched last year, the Duchy of Lancaster supports agricultural students at Myerscough and Harper Adams Colleges and invests over £25,000 each year in academic awards and grants.